Last week was a rough week. Blake breaking his arm really threw me for a loop. To say I was stressed was an understatement. I need my "therapy" - I needed to scrap. Saturday I did. I really didn't do much else. Instead of staring at photos and product and trying to find a starting point, I decided I was going to scraplift a few layouts that I loved to get the creative juices flowing. 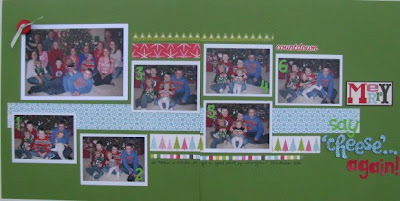 I printed out some layouts by Shannon Zickel that I found on the Jillibean Soup blog. Then I matched up photos with each layout. Most of the photos I pulled were Christmas photos and they all had a story that I wanted to scrap along with them. I still had the "Everybody Loves Christmas" line by Echo Park out on my workspace. (Remember, I used it to make a Valentine's Day layout for Crop Chocolate...here.) I decided to go ahead and use the rest of the line before pulling out any other Christmas products. *Please note that I didn't cut off our heads in cropping the photo! Kevin did it when he took the shot on Christmas morning! Oh, I love a mixed title. And pop dots. And buttons. With twine. Seeing a trend? 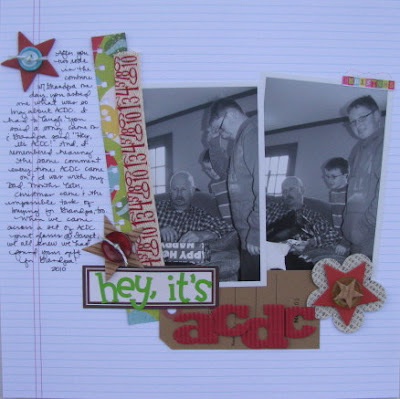 "Hey, it's ACDC" is an exact scraplift. Yes, I stole her layout. I admit. I liked it so much. The differences? Well, I used some chipboard stars since I didn't have enough corrugated ones and I used different papers and alphas. Plus, I cut the name of the paper line off the bottom strip of one of my papers and I added it as a "tab" at the top of one photo. Yep...MY idea there. Background story...I remember Dad saying, "Hey, it's ACDC" whenever we'd hear one of their songs. He did that in the tractor with my boys one day and later they asked me what was so "big" about ACDC. I had to laugh. It's just one of those things... Well, before Christmas, I found a set of ACDC pint glasses in Target. I bought them for the boys to give to Dad at Christmas. HAD to scrap that memory! I love that I had a set of mixed alpha stickers by American Crafts that matched the paper line I was using. "Thanks Bro" is a pretty close lift of one of Shannon's 2-page 8-1/2x11 layouts. I stretched mine to 12x12, rounded my corners and straightened my photos. Every year the boys buy a special gift for each other. I even hand-cut some trees out of a paper and added them with pop dots (what else?!?). "Merry Merry Merry" is sooooo simple, but it's one of my favorites. And it's a direct lift (pretty much - changed the photo sizes). I had to scrap Blake opening his watch on Christmas since it was a special gift. I didn't use any patterned paper on this one (unless you count the Scenic Route grid background). 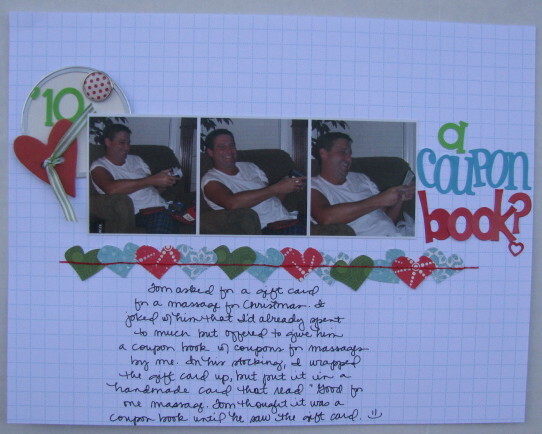 The red circles to the right of the photos are tags by Shabby Chic Crafts. I added the brads. I used a green snowflake sticker from the Echo Park line (adhered with pop dots!). 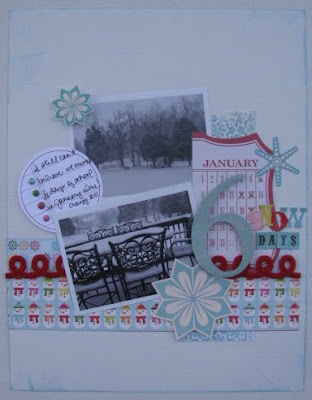 "6 Snow Days" might be my favorite layout from Saturday. This is a lift, but I did mix it up a bit. I even broke out my new Tim Holtz Tumbled Glass distressing ink to ink my "6" chipboard. The color wasn't exactly right, so I added Mr. Huey White mist (by Studio Calico) over top and then the color was PERFECT. I liked the ink and continued to ink the edges of my layout. I love to scraplift. Every so often I need to. 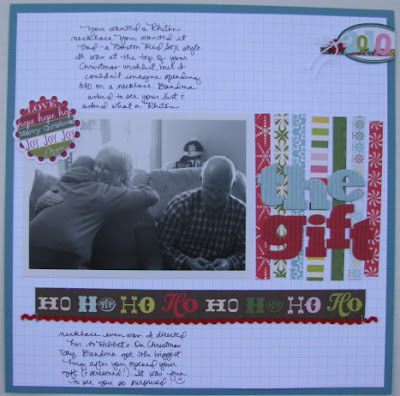 It really gets me over a hump and allows me to complete several layouts quickly. Plus, certain elements on a layout remind me of things in my stash that I should be using. Too bad I have to go to work tomorrow...I'm really on a roll scrap-wise! Wow these layouts are all amazing. 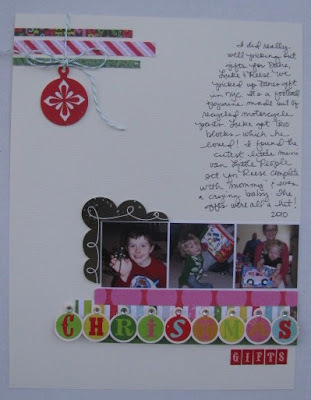 I love the circles I love the use of strips and scraps and the white space. I love the mixing of this and that just perfect and most of all I love your motto for the year it is one that I have adapted as well. If you have it use it!! 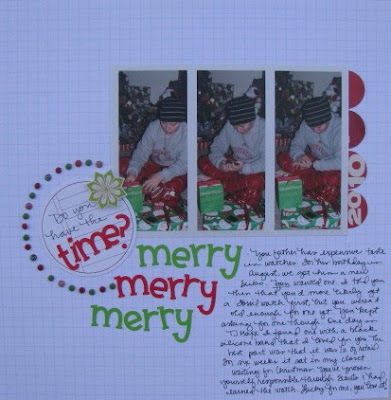 WOW, these are absolutely amazing, love your use of circle, your titlework, THAT journaling and your white space, amazing! You are amazing! Even scraplifting to get this much done! I love all of the little details you added and your titles are definitely my favorite part of each page. Your layouts are fantastic! 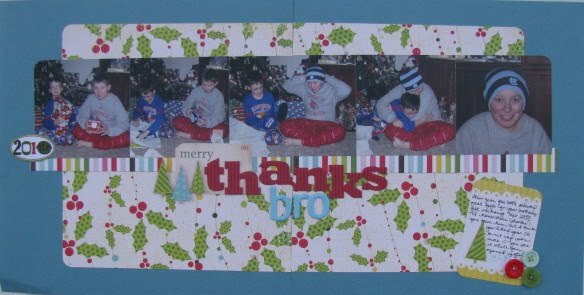 I can't believe how quickly you are able to scrap such great layouts! I love those days when the creativity just flows... I have this paper also & will be using it at a crop over the weekend. Thanks for the ideas! LOVE them! You amaze me!